Today I'm sharing a get well card that I created with this fun chipboard piece! This lovely, detailed piece fits beautifully on an A2 size card. I began with an A2 size kraft card base. I then created a grass/sky scene from cardstock for the background. so I decided not to color it in any way. and adhered that in place to the bottom of the well. I then adhered the well to the card base. I then stamped this sentiment...pun intended...and matted it on cardstock. I didn't want to cover any of the detail of the well! What a great Get Well card, I love that chipboard accent! I agree about the chipboard it didn't need anything a GREAT card Nancy. 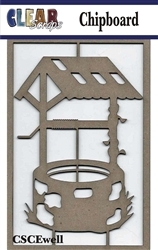 Such a beautiful wishing well chipboard embellishment. You made a lovely card with it.